Summer is upon us and it is heating up nicely here in Cachagua Valley. The vines and fruit trees are soaking up all the warm sunshine, which they are loving. 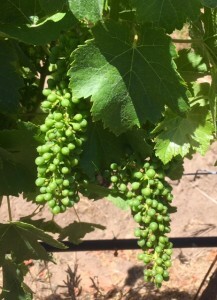 At this stage in time the fruit has set and the clusters are all formed. The grapes on the clusters are still relatively small and hard, but over the next couple of months they will start plumping up. Great wines start first and foremost in the vineyard. Being organically farmed puts us ahead of the game. Our crew takes great pride in working hard to make sure that all the vineyard blocks are getting the attention that is needed to produce the amazing grapes that go into our award winning wines. During these 90°+ days it is nice to escape the heat by popping into the winery and laboratory to do some work. Keeping our white wine tanks chilling for stabilization creates a nice air conditioning effect. This is not only good for the wines, but also the winemakers. Tracking the wine in tanks and barrels is a monthly task. Performing analysis on all wines helps us to maintain the vitality of it depending on the data we collect. At this point we may or may not make any adjustment to the wine in barrel or tank. After all the barrels will be topped. Barrels breath at a low level so wine will evaporate thus needing to be replenished to keep full. There is always plenty of work to be done here at Heller Estate, between our 120 acres of vineyard, fruit trees, winery, bottling line, laboratory and just basic everyday tasks to maintain this magnificent property. 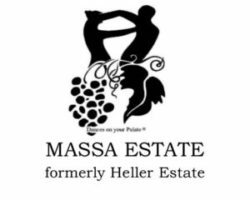 We hope you enjoy your amazing shipment, which includes one of my all time favorite wines that Heller Estates has been produced since 2001, the 2012 Cabernet Franc. This varietal is said to not to be well suited for the Cachagua Valley growing region, but I beg to differ. The 2014 Chenin Blanc, another favorite of mine, is perfect for these hot summer days. To round out this great shipment there is the newly released 2014 Cachagua Cabernet Sauvignon and 2013 Merlot Rosé. I hope you enjoy all these wonderful wines. And the Vines Grow Deeper!